Don't miss the latest issue of Liverpool FC's official monthly magazine! Inside we speak exclusively to Brazilian attacker Roberto Firmino and goalkeeper Simon Mignolet as they review their 2016/17 campaigns and look ahead to what promises to be an exciting 2017/18 season for the Reds. We have all the latest news as the club launches it's 125 birthday celebrations and salute the Reds' best goals from 2016/17, including a look at Emre Can's wonder-strike at Watford as you've never seen it before. We take a photographic journey through the Under-23s' final game of the season against Everton at Goodison Park and go behind the scenes at the club's annual Player Awards night. 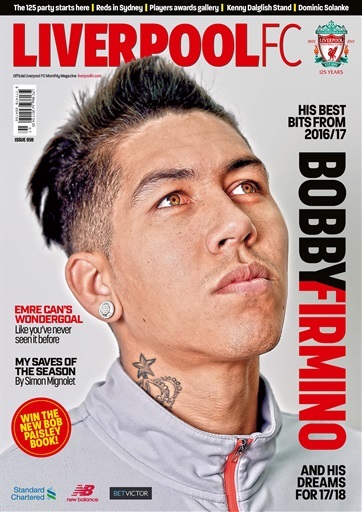 Columnist Neil Mellor discusses new signing Dominic Solanke and we have an exclusive extract from a fabulous book looking at the life and work of legendary LFC figure Bob Paisley. Liverpool Ladies' new arrival Amy Turner discusses a turbulent couple of months prior to joining the Reds and we drop in as the Reds play a post-season friendly in Sydney. Incoming CEO Peter Moore reveals his passion for LFC and we celebrate 25 years of the Centenary Stand, recently renamed in honour of Reds great Kenny Dalglish.